If your child will be undergoing surgery at the center, the staff will do everything it can to make sure everyone is as comfortable as possible - before, during, and after the procedure. We know from experience that it helps to show and tell children, as well as parents what to expect the day of surgery. A nurse from the center will attempt to call you at least one day before your child's surgery to review instructions, including the Preoperative Guidelines and the Day of Surgery Checklist. If you can't be reached by phone, please be sure to call the center during business hours no later than the day before surgery. On the day of surgery, it is a good idea to bring your child's favorite stuffed animal, blanket, toy, or other item from home so he or she will be more at ease. 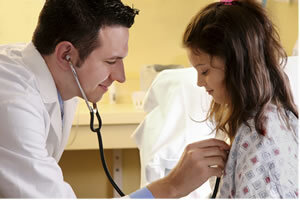 You'll have an opportunity to talk with your child's anesthesiologist. Just before the procedure we'll help get your child dressed into a surgical gown and slippers. Even though we never leave young patients alone, we prefer that you stay with your child at all times, right up until the time your child is brought to the operating room. When your child's surgery is over and he or she is stable, you will be able to join them in the recovery room. IMPORTANT NOTE: Children under the age of 18 must be accompanied by a parent or court-appointed custodian (with appropriate paperwork). If you and your child would like to tour our facility before your day of surgery, we'd be happy to arrange it. Please call us at least one week before your day of surgery to make arrangements.